I have a hunch I might not be the only person ever in this situation, so I want to tell any fellow fearful improvisers there about my favorite gateway improv technique: template recipes. Template recipes are the kind of base recipes that lend themselves well to adaptation. They have a few base ingredients and several places where you could easily swap in something else. Mark Bittman is the king of this method, but here’s my contribution, with all kinds of annotation to help you get started. Tell me about what you make in the comments! These are, for me, one of the key flavor components of the dish. You could substitute full-sized tomatoes, of course, or sun-dried tomatoes, or maybe even leave them out and use tomato pesto, but you’ll get something pretty different if you just skip them. When substituting grains, you want to think about two things: size and cooking time. Any other small grain you like could work here: bulgur, buckwheat, barley, couscous, rice. Because you cook the grain as a separate step, you can decide how much you care about cooking time; you could also use leftovers of something you’ve already cooked. When improvising, I recommend sticking with relatively neutral oils for cooking, like olive, canola, or safflower. If you want it, you can add a dash of a more strongly flavored oil later in the cooking process for the taste. Subbing members of the onion family — onions, leeks, purple onions, shallots, scallions — for each other usually works out fine. Scallions, shallots, and leeks are a bit milder in taste, so you’ll want to use more to get the same strength of flavor. Purple onions look silly when cooked, but taste fine. This is really code for “a vegetable with a bit of crunch.” Green beans or asparagus would work well here; you could also use edible-pod peas, shredded carrots, or more than one of the above. You can almost always substitute dark leafy greens for each other: I use kale and chard most often. You can substitute spinach too, which cooks a little more quickly. You’ll want to check on greens by tasting them after they wilt until they reach the desired level of tenderness. You could substitute a mild bean here: edamame, of course, or cannellini. The pesto is a key flavor in this dish. If you want to experiment with other options, go for something that’s roughly the same thickness: tahini sauce might work, but marinara probably won’t. The key factor here is crunch: you could substitute seeds or a nut like chopped almonds without a super-strong flavor. In a dish like this, where you mix a bunch of ingredients together, you can almost always flex on quantities. I usually do this mostly to use up the quantities things come in: a whole bunch of chard or bag of spinach, one pack of tofu or cherry tomatoes. 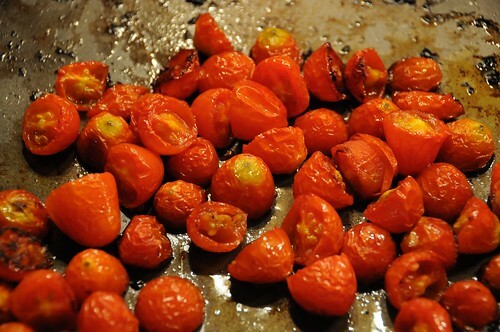 Preheat your oven to 350 F. Chop the cherry tomatoes in half. Get out a square baking pan; if it’s not non-stick, you might be wise to line it with aluminum foil, as scrubbing off caramelized tomato sugar is not the most fun activity ever. Put the tomatoes into the pan, and add a splash of olive oil. 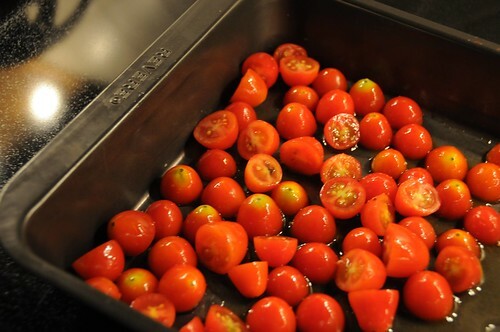 Your goal here is to be able to coat the tomatoes lightly in oil, but too much is better than too little. Sprinkle with 2-3 pinches of salt and bake for 45 minutes, stirring once or twice, until they’re shriveled. 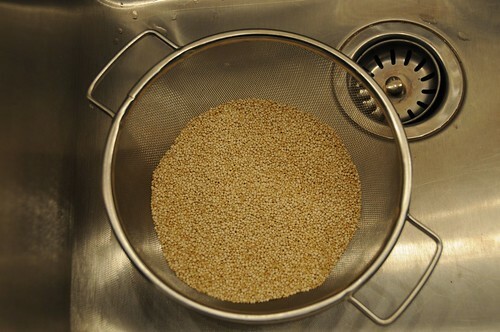 Now, start the quinoa: the first step is to rinse the quinoa in a strainer. This is important because unwashed quinoa tastes like soap, and it’s usually hard to tell if the manufacturer washed it for you. 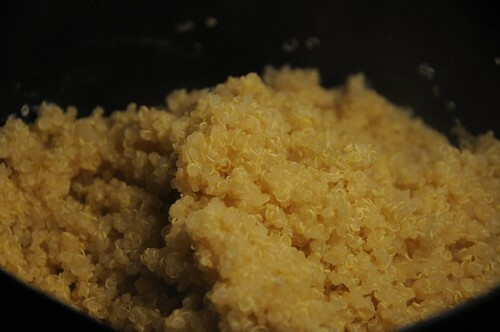 Stick the quinoa and four cups of water in a saucepan, and put it on high heat until it boils. Then turn the heat down and simmer for about 15 minutes. It’s done when it is tender to the bite, like rice; you’ll be able to see little curlicues in many of the pieces. It will probably just absorb all the water in this process, but drain it in the strainer if there’s any left in the bottom of the pot. 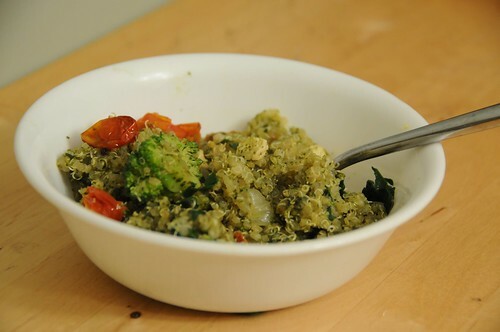 Then fluff up the quinoa with a fork. While the quinoa and tomatoes are cooking, dice the onion. Put it in a pot over medium low heat with a splash of oil and a big pinch of salt so it starts to caramelize. Stir it once in a while so it cooks evenly. 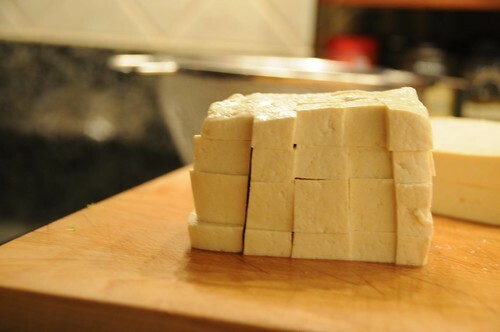 Now chop up the tofu into bite-sized pieces. 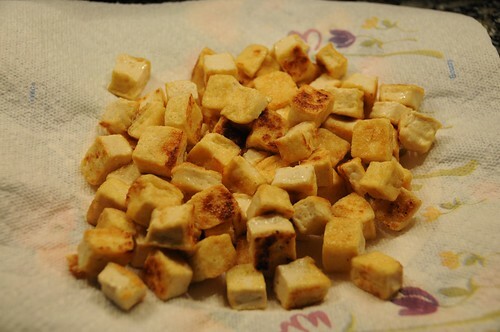 Heat a skillet over medium-high heat with a splash of oil in it, then throw in the tofu and cook, stirring occasionally, until it’s golden on at least a couple of sides of each piece. Turn it out on to a paper-towel-lined plate. When it is, you can turn up the heat under the onion to medium-high. 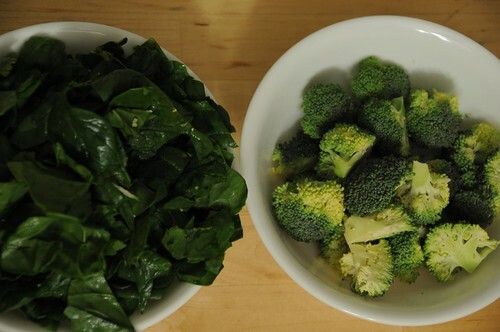 Throw the broccoli in, along with a splash of water; a tablespoon or so should do it. Cover the pan for a bit to let the vegetable steam: I’d give green beans and asparagus a minute, and maybe a minute and a half or two for broccoli. You don’t want it to cook all the way through, just to turn bright green. Remove the cover and add your chard. Cook for another couple of minutes, stirring frequently, until it is wilted and tender. Throw in the tofu and the cooked quinoa, and cook until heated through. Remove the pan from the heat and stir in the pesto — add more if it doesn’t taste pesto-y enough for you! — along with the nuts and tomatoes, plus salt and pepper to taste. You can serve it as is, or with more pesto or parmesan cheese on top. For me, this makes about eight servings and takes about an hour to get on the table; it also reheats beautifully.